What a nice, relaxing week that was. I had time to sleep, get chores done, cook, watch TV, and even work on projects like making this stuffed whale for my nephew. 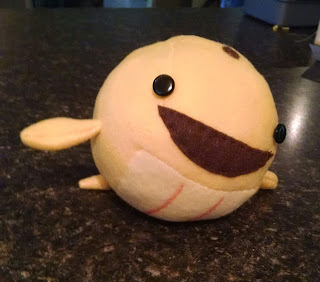 He asked for the Golden Whale from the Castle Crashers video game but it isn't popular enough to be a manufactured toy. You can see what it is supposed to look like here. I found a blogger who had sewn one so I followed her example and made it myself. I think it turned out quite well. My nephew comes back from visiting his relatives tomorrow and I need to have everything (clothes, his school stuff, food, dogs) out at the mobile home because his plane doesn't get in until the evening and I don't want to have to go back to the house and then unload the car in the dark. It is my goal to get out there before noon and then have time to get things organized and relax before I pick him up. The next 18 weeks are going to be busy but I am trying not to stress about it too much. I will just focus on the tasks of each week and we will make it to May, the end of the school year. After that, my plans depend on my nephew's driving ability. Anyway, enough talk about the future. The weather has been very nice this weekend and I did a lot of pruning and weeding in the back and front yards. I didn't get to cleaning up the alley yet. Maybe next weekend. My nephew is supposed to help me with that project. I've been working on my cooking skills. It started when I was watching Worst Cooks in America. Ok, it started before that since I have always wanted to cook good tasting food, but during this particular break from work, I started watching that show and then I actually went out and bought ingredients to try things myself. I cooked a whole chicken for the first time in my life and it turned out quite tasty. I bought spices and I've been using them. I also bought garlic and an onion but I only used the garlic so far. I wish I had more time at the house with the oven because I bought ingredients for beef stew, lasagna, meatloaf, and macaroni and cheese. I'm trying to make the meals from scratch that I usually buy as frozen bricks. I'm not going to make every meal from scratch but maybe I can cook one or two meals on the weekend and freeze them for later in the week. That would be a huge improvement from my usual routine of opening a can or putting a box in the microwave. Well, break time is over. I better keep up or life will pass me by. Time to get this year started! Fluffy whale looks very well made and pleasantly unusual! Good luck on the cooking. It never really works for us, but most people find it pretty easy(ish) to maintain. I recommend a crockpot. Anything that can be cooked in one pot is generally easy to keep up on. I grew up mainly eating chili, beef stew, bean soup, spaghetti (sauce made in the pot) and minestrone. Thanks, Lizzie. He was impressed and thought that I found somewhere to purchase it. He couldn't believe I made it. Hello Abigail! I don't use my crockpot enough. Definitely room for improvement there. Thanks for the ideas. I need them. We usually have spaghetti, burritos, lasagna, beef stew, meatloaf, meat+potatoes, pizza... all mostly store bought. I made beef stew from scratch tonight, well, I did use the packet of beef stew seasoning so maybe that is cheating, but I'm getting there!